Brexit is now a reality. But beyond the huge financial, economic and political implications, we cannot forget that at the core of this debate is our basic humanity. But Jo’s story only briefly dominated the news headlines, some even forgetting why, and how, she was murdered. It involves both Brexit and the treatment of women politicians. I was on another continent — so I couldn’t offer help with logistics. But as an artist, having met her, I wanted to express my support and serve Jo’s memory through the thing I knew best, art. Late at night, I emailed Jo’s friends the artwork. When I woke up a day later, countless photos of people gathering for Jo were flooding in on social media, newswires, TV. Thousands of people in Trafalgar Square were holding up the portrait of Jo on posters, boards and pledge cards. People from all walks of life were doing the same in Batley, Dublin, Buenos Aires & New York. 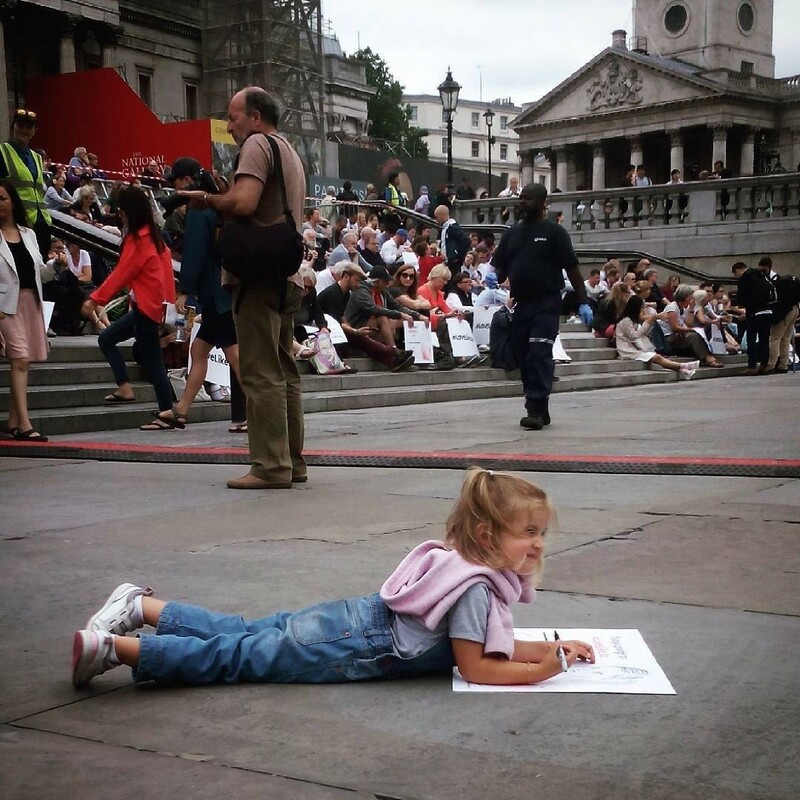 The image had taken on a life of its own as part of this larger movement — it was being carried by love, with people building their own meanings on top of it, all of them resolving to #LoveLikeJo. Tears arose in my eyes. Particularly moving were the many children participants, from various nationalities. They give us hope that Jo’s legacy of love can still win over hate, cynicism, and xenophobia. These children are the “Jo Cox Generation” — the ones who will make our world more peaceful and inclusive. In this photo by Instagram account @colombiana247 a beautiful child of Colombian-British descent holds the portrait carefully in his hands. A little girl came walking up to him from the crowd and said: can I see it? In the photo below by @Mariafamm, a blond girl lies on her stomach with the portrait in her hands. 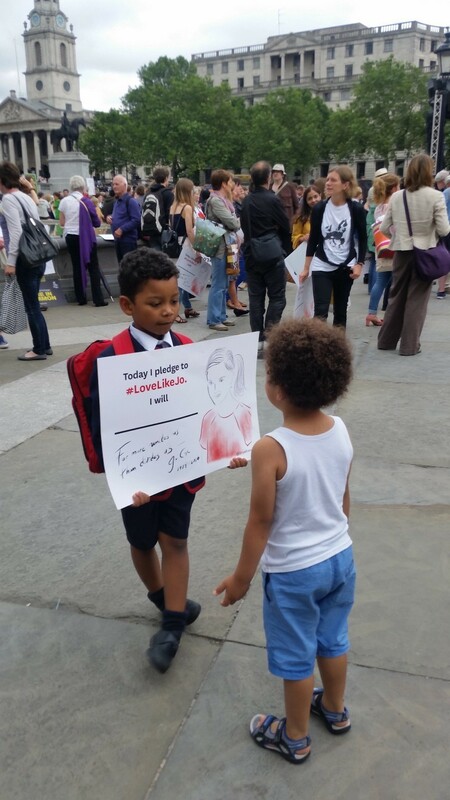 There are hundreds more photos on social media via the hashtag #LoveLikeJo. It was clear that the portrait of Jo did not reside in a single image anymore. All of these stories and people — young and old, of diverse races and faiths, became a part of a broader tribute celebrating not just Jo, but her life, her ideas, and her values. It was, and continues to be co-created with the people who engage with it both offline and online. This was an open, participatory piece of art. After the memorial, people took Jo with them. On Twitter and Instagram, they have posted images of the portrait in their children’s bedrooms, in their windows, and even office cubicles. I believe Jo will be watching over all of them. People have hung the Portrait of Jo on the walls of their children’s bedrooms (far left), in their windows (middle) and in their office cubicles (far right). If you are interested in a limited edition print of Jo’s portrait, sign up here. 100% of the proceeds would benefit Jo’s causes.